There is no need to scare from Mangal. 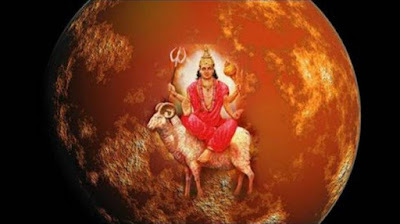 There will be delay in getting married or problems after marriage due to Mangal Dosha. Every one’s age is depending on his/her horoscope. There will be difference in thoughts after marriage due to Mangal dosha. This creates conflict. There might be separation due to Mangal dosha. The bad effect of Mangal creates problem in child happiness. Child becomes weak due to bad effect of Mangal. Take care of eyes and head if there is a Mangal dosha. Parents suffering from Mangal dosha affect child’s bone. In this case, parents should try to strengthen children bones. Children can eat gram. Parents should take care of children’s hormone level. Children can drink water in copper glass. Children are angry for parents who suffer from Mangal dosha. In this case, children should avoid juicy and stale food. Parents should avoid quarrel in front of children. Children can wear silver ring. Serve veterans and do Pitru shradha if there is threat and anger increase after marriage. Donate milk and spices. Do not wake up till late night and wake up before sunrise. Keep water in silver or glass in utensil near head. Women can put water on left and men can put water on right side while sleeping. If there is financial crisis after marriage due to Mangal dosha then husband-wife can pour milk on Shri Yantra with 1008 psalm. If relatives are going away after marriage then daily worship Ganesha. Serve girl and give food to her on full moon day.